What is a Catholic attitude towards the races and the problems arising from race? We human beings are intensely social creatures, which is the cause of some of our greatest ills: L’enfer c’est les autres said Sartre; hell is other people. There is some truth in that. In SSPX South Africa other people have been the principal problem since Jan van Riebeeck landed in the Cape. Races are a consequence of Original sin. I have an idea that the division of tongues at the Tower of Babel went beyond linguistics, and affected physical appearance and other differing traits, in such manner to ensure that men would never be able to unite together again and convince themselves they were lords of Creation above the Lord of Creation Himself. Not that there hasn’t been any want of trying. Men have always dreamed of Empire, a single universal state that would eliminate war and all disharmony among the peoples and inaugurate an era of social peace and security. Alexander the Great dreamed of a fusion of the Greek and Persian cultures that would make his newly-conquered empire permanent. The Romans, with their strong legal tradition, expressed the idea in the pax romana, or Roman peace, and for a century came close to implementing it. Our modern age, savaged by revolutions and unbelievably bloody wars, is obsessed with the idea, and from the League of Nations onwards has striven to make it, finally, a permanent institution. All in vain. Humanity has as much hope of creating a worldwide utopia as it has of abolishing death. We all live under the sentence of Adam; our best hope of gaining a modicum of haziness in this life, in addition to the hope of happiness in the next, is to accept that sentence. The acceptance is vital: in the unavoidable consequences of Original sin there are good things without which we cannot live. Any attempt to abolish those consequences will destroy the good things. The result will be total ruin. Let me make myself clear. Some of the consequences of Original sin can be overcome or at least mitigated. These are the, formes peccati, the wounds that sin has left in our natures: ignorance, malice, concupiscence and weakness. It is our business, aided by God’s grace, to overcome these wounds by their opposed virtues, thereby preparing for heaven. There are, however, other consequences that cannot be removed. The miseries inherent in them we have to learn to live with as a reminder that heaven is not in this world. Poverty, sickness, death, will always be with us no matter what we do to eliminate them. Furthermore, if we did succeed in eliminating them we would in for a host of unsuspected evils far worse than those we had removed. What would become of a man who knew he would live forever in this world, free from sickness and pain? No reckoning to be made before God, no physical punishment to fear, no heaven to hope for-it would be a ground too fertile for his pride and appetites to resist. Noah’s contemporaries lived to be over 900 (I see no reason to doubt the literalness of the Genesis account) and became such depraved sinners that God had no choice but to destroy them all. Would we do any better? In attempting to eliminate the differences caused by race, the modern world is opening a pandora’s box, the consequences of which are now becoming obvious. Race is important. Not in itself, as if a man’s worth depended on skin tone. Just in case anyone is tempted to think I am advocating White supremacy, let me mention that in a series of IQ tests done in the USA on Asians, Whites, Latin Americans and Blacks, the Asians came out tops. On average, a little yellow man is smarter than I am. In addition, when someone makes a judgment about his race’s superiority, he usually uses as criteria qualities that are strong in his race, playing down qualities that are strong in other races. It is quite natural, since those qualities he esteems are those he is familiar with, having been brought up with them, whilst the unfamiliar he easily judges as inferior. Hence many Whites will judge their culture as being superior because it is more technologically advanced. An Arab on the other hand, will judge his culture as being superior because it is more religious. The point, however, is that there is a great deal more to race than skin colour. A man is a social animal. He lives in a group, couldn’t develop or survive without it, and is moulded by that group far more than he realizes. By ‘group’ I don’t mean just a juxtaposition of individuals. I mean a coherent society, an ordered body of people who have certain fixed convictions, moral norms, patterns of behaviour, customs, habits, attitudes, ideas, that all together constitute something the man can belong to: be part of, work for, be loyal to, love. And invariably any truly solid group is a race. 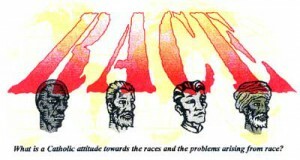 What perpetuates a race is not just a geographical location, but the fact that the members of that race are in an established society that has beliefs, traditions, rules and everything else that goes into `culture’ (a thoroughly misunderstood word), and which gives its members a clear direction in their lives, a path to follow with some kind of distinction between good and evil. History shows that men of such societies have often been barbaric to other societies-a direct consequence of Original sin- but their own they have always treated according to rules that were an approximation to the Ten Commandments. Any society whose members regularly abuse, cheat, rob, violate or kill each other invariably disintegrates. There are no exceptions. Remove the convictions, the norms, the behaviour that a settled society inculcates into an individual and he will become “a wolf for man”, to quote Hobbes. A child at birth has Original sin’s effects in the raw state, with a natural (not necessarily sinful) egotism, willfulness and greed that have to be curbed by his parents. Let any child have his way in everything and he will be in great danger of growing up a delinquent monster; unstable, untrustworthy, dishonest, lazy, and with his appetites out of control. I would be interested to see the results of an experiment in completely `non-directional’ parenting, though I would pity the subject. Virtue, in fact just `civilized’ behaviour, does not come naturally to us sons of Adam. We have to be trained in it, and it is only in a group, a settled society, that the training can be effectively done. Is it possible to have a settled society that produces stable and law-abiding individuals, and that is not dependent upon race? In the long term, no. The great empires in history, multiracial by the very fact of their being empires, were temporary structures. The administrative, military and architectural genius of the Romans enabled them to create an empire, but once the empire was truly cosmopolitan and the fact of being a Roman no longer implied a special status, then it went into irreversible decline. Ditto for the Persians, the Greeks, the Arabs, the Mongols and the rest. Once the cohesion of society is diluted by the juxtaposition of people of other societies, then the spiritual and moral fibre of that society is weakened, and the virtues that made up its strength are lost. Racial mixing is not good It is not for nothing that the Church has always discouraged-not forbidden, but discouraged—interracial marriages. And the race the worst affected is the dominant one, the one that ruled the others. To the theory that the Blacks were destined by God to be hewers of wood and drawers of water for the other races, I will answer only that once a people no longer hew their own wood or draw their own water, they are lost. That kind of ruling class is destined for decay. What, then, can one do when more than one race occupies the same land, and is contained within the borders of the same state? Historically, there have been two solutions to the problem. The first is for one race the wipe the other off the face of the earth, as the Anglo-saxons did for the Celts in Britain, and the Bantu tribes and Boers for the Bushmen, and the American settlers (almost) for the North American Indians- Such a solution may solve the problem, but it remains morally indefensible. The other solution is far the races to find some common denominator strong enough to form a new, single society, and intermarry, creating a new race. Thus did the Franks do with the Gauls, the Lombards with the Romans, the Spanish and Portuguese with the South American Indians. What was the common denominator they found? The Catholic Faith. The cornerstone of any society is religion. Morality, manners, everything, are built on convictions which are always religious in nature. If men share the same religion, they will have a bond far stronger than any other, and that lend, given time, will eventually bring the other differences into line. And the truer the religion (if I can speak in that way) the stronger the bond, since a—the—true religion gives men the motive and the means to overcome the evil tendencies in their fallen natures, tendencies which turn man against man. An example: when Iran fought Iraq, young Iranian boys were exhorted to walk through the minefields to clear them for the soldiers, with the promise of paradise when they were blown up. No Catholic Pope could ever have dreamed of making Catholic boys do anything like it, not even in the Crusades or the religious wars of the 16th century. Let the bulk of the population in South Africa become Catholic—properly Catholic—and I guarantee that over time all the problems arising from race will be quietly resolved. Besides religion, is there easy other bond that can pull races together into a peaceful co-existence leading possibly to an eventual fusion? The answer, very sadly, is no. Without some sort of religion, a single society itself cannot hold together. Remove religious convictions and morality has its foundation knocked from under it; remove morality and virtue remains stillborn; with virtue gone sin goes unchecked and disintegration soon follows. What hope then, does such a society have of melding with another having differences that make the two already naturally antagonistic? This is all the drama with present-day South Africa. Since 1994 a concerted attempt has been made to fashion a single, harmonious society on foundations that are not religious, foundations in fact that remove any influence religion had in the first place: The 1994 Bill of Rights made human rights the new social glue: “[The Bill of Rights] amounts to a series of ethical norms which are to guide the behaviour of political leaders, all branches of government and administration, and even the behaviour of ordinary citizens in their dealings with one another.”—South African Constitution, chap. 3. Six years later than anyone with his eyes open can see that it does not and will not work. This country is steadily unraveling, with only a good infrastructure and a modicum of wealth to retard the decline. a) Never make moral generalisations about other races. Every race has its saints and its criminals. The differences of behaviour between the races are not enough to determine one’s attitude towards any individual of that race. Each individual must be appraised individually. And among your criteria let the first be a person’s strength of Faith and goodness of heart. b) Male efforts to really get to know persons of other races well, especially if they are fellow parishioners. I confess that was only when I became a priest that, in the line of ‘duty’, I began to get to know Blacks, Indians and Coloureds well, and some of the most saintly and upright people I have come across I met amongst them. c) When the occasion presents itself, help out persons of other races. I don’t mean financially, I mean actively, by giving lifts to church, say, or finding jobs for, or taking to hospital. It is important that this be done naturally, out of simple spontaneous charity and without waving the flag of the social reformer. All this one can do and still be proud to be of the race one is, proud of its good qualities and achievements without denigrating the good qualities and achievements of other races. But always bear in mind that it is not races, nor peoples nor nations that pass to heaven, but souls, and in heaven distinctions of race, people and nation no longer matter—and heaven, never forget, is what we were created for.